I woke up to a cliff dwelling morning. The sun was my clock. The tea was sage, a sprig gathered the previous day to settle a slight indigestion. Pup ate fish stuff for breakfast and I had a timely-named “Clift” bar. The crows rose on drafts of air and a rufous-sided towhee rustled in the leaves attracting the dog’s attention. 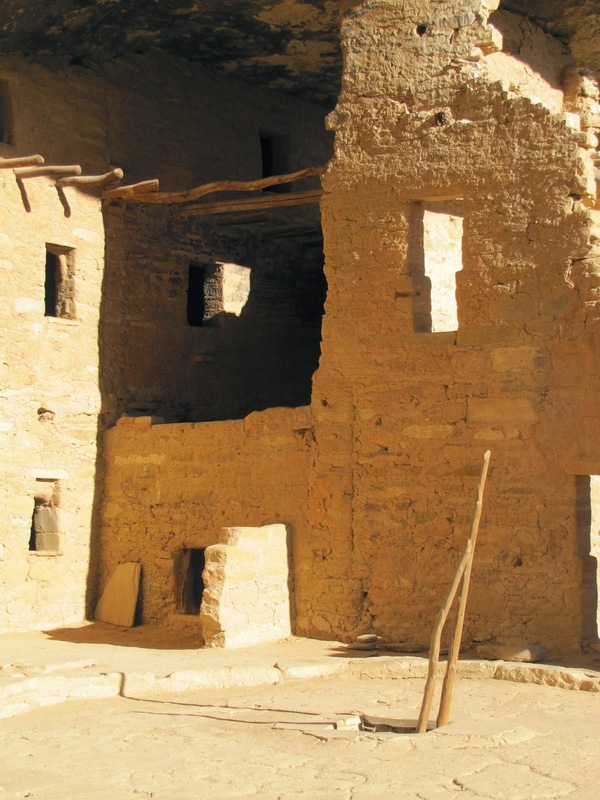 Around the late 1200’s there were over 600 separate cliff dwelling villages nestled across the area now known as Mesa Verde National Park. 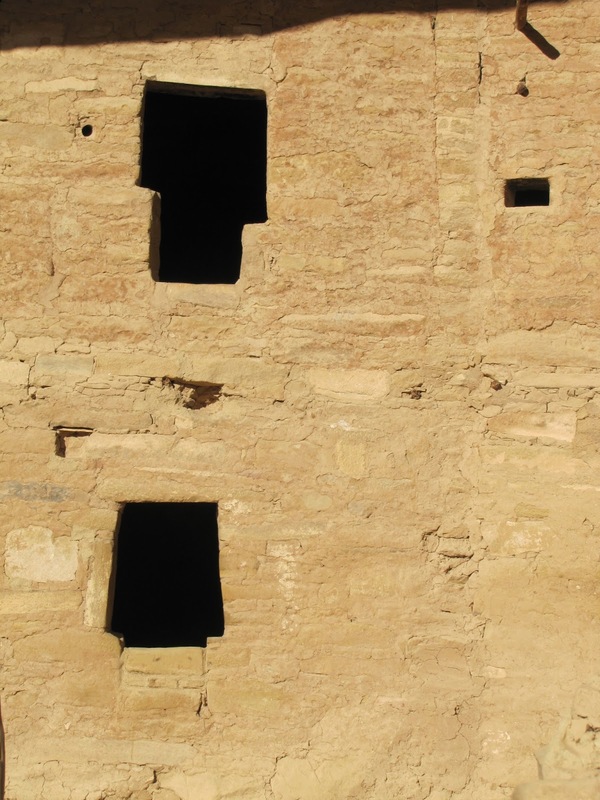 I have seen many photos of cliff dwellings, but I think I mistook them for being one and the same. Driving along the cliff tops of the Mesa Verde National Park I began to realize that I had been quite mistaken. At times I could see as many as five separate cliff dwelling villages across a canyon, knowing that below my feet were more that I could not see. I had arrived on a Thursday afternoon with enough time to slowly wander by the cases of artifacts removed from various dwellings over time. 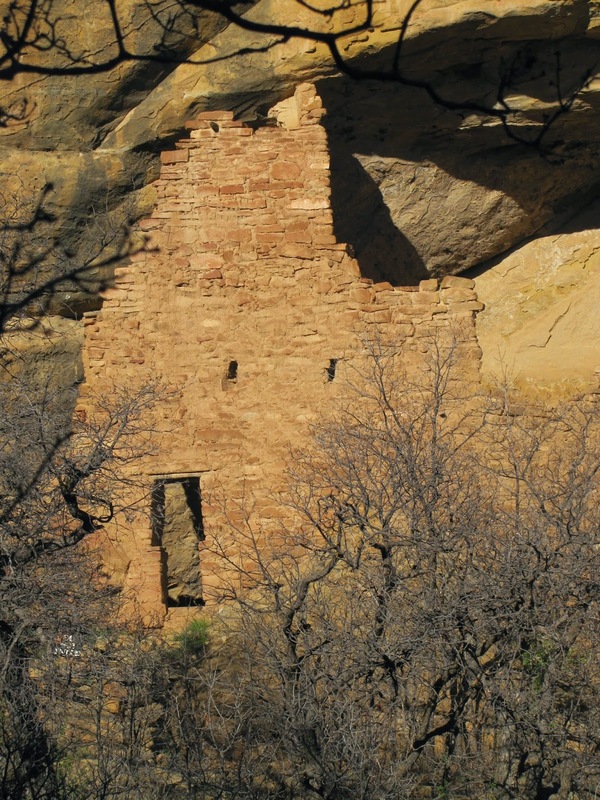 The Anasazi as they were once called (now Ancient Puebloans) mysteriously left them homes in the cliffs in mass exodus around 1270 leaving much behind, as though expecting to return one day. The well-concealed and difficult to access villages mostly remained lost until the late 1800's. Notice the bottom door was redesigned into a rectangle. Take your time to peruse these photos. These stones waited patiently eons for you to see. I have been reading books on these ancient people and attended an evening ranger talk floating theories of why they left. Some say war, some say drought and some say that as key contributors left the community, the remaining community fabric disintegrated. I have another theory. 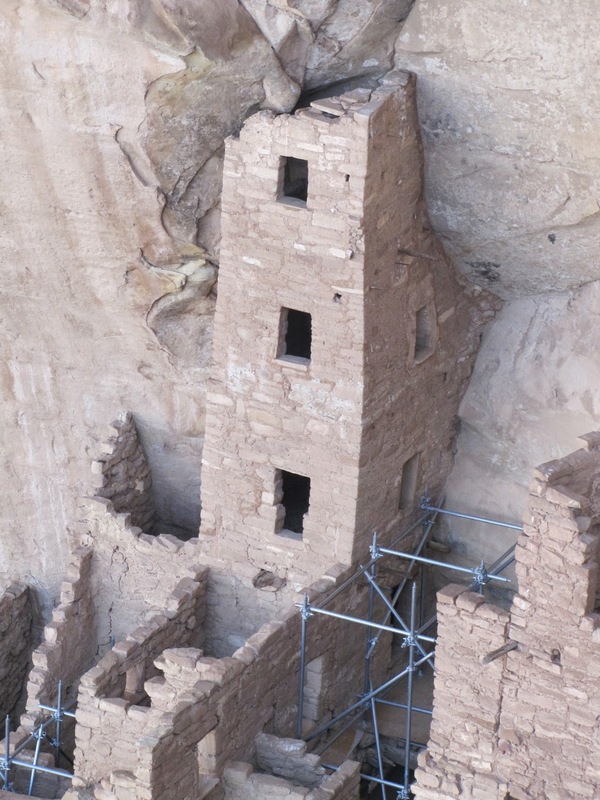 Hearing rangers warn older visitors to by-pass climbing down ladders and descending and ascending the hundreds of almost vertical steps, I began to wonder if the Anasazi suffered from a generational shift towards too many elders. Old in Anasazi years would have meant to be in your mid to late 40’s. A lifetime of lifting stones and climbing steep walls to get to the crops on the top would have caused arthritis or heart conditions. Poor nutrition due to drought may have caused more infant deaths. 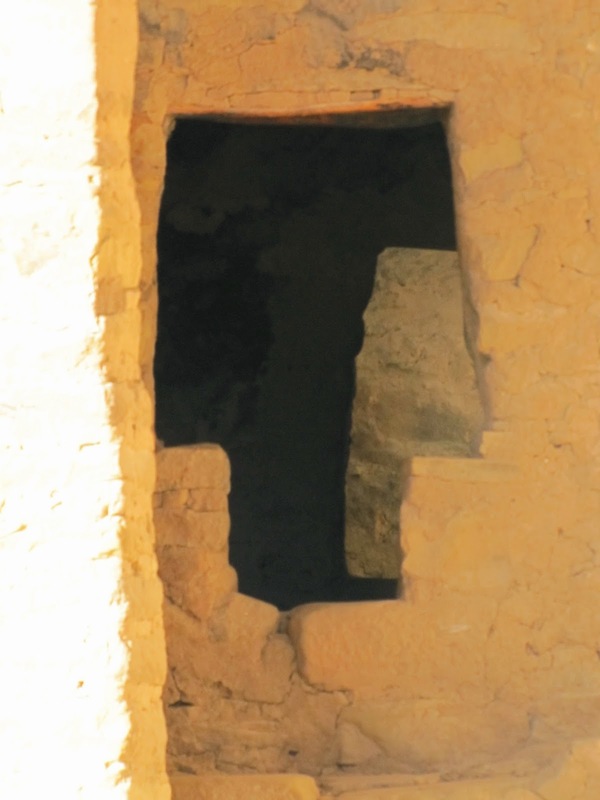 Just as we now have an aging population, the Anasazi elders may have wished to move to flat land, one level homes much like ranch houses. A shift from high-rise tenements without elevators to the suburbs with drive to the door capacity. My theory… just pondering all those stairs and cliffs.